"Mahaveera" redirects here. For the 1988 Bollywood film, see Mahaveera (film). Mahavira, also known as Vardhamāna, was the twenty-fourth tirthankara (ford-maker) who revived Jainism. He expounded the spiritual, philosophical and ethical teachings of the previous tirathankaras from the remote pre-Vedic era. In the Jain tradition, it is believed that Mahavira was born in the early part of the 6th century BC into a royal Kshatriya family in present-day Bihar, India. He abandoned all worldly possessions at the age of 30 and left home in pursuit of spiritual awakening, becoming an ascetic. Mahavira practiced intense meditation and severe austerities for 12 years, after which he is believed to have attained Kevala Jnana (omniscience). He preached for 30 years and is believed by Jains to have attained moksha in the 6th century BC, although the year varies by sect. Scholars such as Karl Potter consider his biography uncertain; some suggest that he lived in the 5th century BC, contemporaneously with the Buddha. Mahavira attained nirvana at the age of 72, and his body was cremated. After attaining Kevala Jnana, Mahavira taught that observance of the vows of ahimsa (non-violence), satya (truth), asteya (non-stealing), brahmacharya (chastity), and aparigraha (non-attachment) is necessary for spiritual liberation. He taught the principles of Anekantavada (many-sided reality): syadvada and nayavada. Mahavira's teachings were compiled by Indrabhuti Gautama (his chief disciple) as the Jain Agamas. The texts, transmitted orally by Jain monks, are believed to have been largely lost by about the 1st century (when they were first written down). The surviving versions of the Agamas taught by Mahavira are some of Jainism's foundation texts. Mahavira is usually depicted in a sitting or standing meditative posture, with the symbol of a lion beneath him. His earliest iconography is from archaeological sites in the North Indian city of Mathura, and is dated from the 1st century BC to the 2nd century AD. 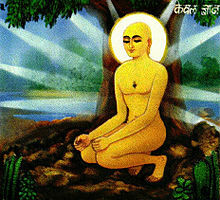 His birth is celebrated as Mahavir Jayanti, and his nirvana is observed by Jains as Diwali. Surviving early Jain and Buddhist literature uses several names (or epithets) for Mahavira, including Nayaputta, Muni, Samana, Niggantha, Bramhan, and Bhagavan. In early Buddhist suttas, he is referred to as Araha ("worthy") and Veyavi (derived from "Vedas", but meaning "wise" in this context; Mahavira did not recognize the Vedas as scripture). He is known as Sramana in the Kalpa Sūtra, "devoid of love and hate". According to later Jain texts, Mahavira's childhood name was Vardhamāna ("the one who grows") because of the kingdom's prosperity at the time of his birth. According to the Kalpasutras, he was called Mahavira ("the great hero") by the gods in the Kalpa Sūtra because he remained steadfast in the midst of dangers, fears, hardships and calamities. He is also known as a tirthankara. Although it is universally accepted by scholars of Jainism that Mahavira lived in ancient India, the details of his life and the year of his birth are subjects of debate. 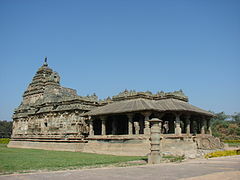 According to the Digambara Uttarapurana text, Mahavira was born in Kundpur in the Kingdom of the Videhas; the Śvētāmbara Kalpa Sūtra uses the name "Kundagrama", said to be located in present-day Bihar, India. Although it is thought to be the town of Basu Kund, about 60 kilometres (37 miles) north of Patna (the capital of Bihar), his birthplace remains a subject of dispute. Mahavira renounced his material wealth and left home when he was twenty-eight, by some accounts (thirty by others), lived an ascetic life for twelve years and then preached Jainism for thirty years. Where he preached has been a subject of disagreement between the two major traditions of Jainism: the Śvētāmbaras and the Digambaras. The Śvētāmbara tradition believes that Mahavira was born in 599 BC and died in 527 BC, and the Digambara tradition believes that he died in 510 BC. The controversy arises from efforts to date him and the Buddha; according to Buddhist and Jain texts they are believed to have been contemporaries, and (unlike Jain literature) much ancient Buddhist literature has survived. Almost all Indologists and historians, says Paul Dundas and others, date Mahavira's birth at about 497 BC and his death at about 425 BC. However, the Vira Nirvana Samvat era began in 527 BC (with Mahavira's nirvana) and is a firmly-established part of Jain tradition. The 12th-century Jain scholar Hemachandra placed Mahavira in the 5th century BC. Kailash Jain writes that Hemachandra performed an incorrect analysis, which along (with attempts to establish Buddha's nirvana) has been a source of confusion and controversy about Mahavira's nirvana. According to Jain, the traditional date of 527 BC is accurate; the Buddha was younger than Mahavira and "might have attained nirvana a few years later". The place of his nirvana, Pavapuri in present-day Bihar, is a pilgrimage site for Jains. According to Jain cosmology, 24 Tirthankaras have appeared on earth; Mahavira was the last Tirthankara of Avasarpiṇī (the present time cycle). [note 1] A Tirthankara (ford-maker, saviour or spiritual teacher) signifies the founding of a tirtha, a passage across the sea of birth-and-death cycles. A member of the Kashyapa gotra, Mahavira was born into the royal kshatriya family of King Siddhartha and Queen Trishala of the Ikshvaku dynasty. [note 2] This is the dynasty in which Hindu epics place Rama and the Ramayana, Buddhist texts place the Buddha, and the Jains attribute another twenty-one of their twenty-four tirthankaras. According to Digambara Jains, Mahavira was born in 540 BC; Svetambara texts state that he was born in 599 BC. His birthday falls on the thirteenth day of the rising moon in the month of Chaitra in the Vira Nirvana Samvat calendar era. It falls in March or April of the Gregorian calendar, and is celebrated by Jains as Mahavir Jayanti. Kundagrama (the place of Mahavira’s birth) is traditionally believed to be near Vaishali, an ancient town on the Indo-Gangetic Plain. Its location in present-day Bihar is unclear, partly because of migrations from ancient Bihar for economic and political reasons. According to the "Universal History" in Jain mythology, Mahavira underwent many rebirths(Total 27 births) before his 6th-century birth. They included a denizen of hell, a lion, and a god (deva) in a heavenly realm just before his last birth as the 24th tirthankara. Svetambara texts state that his embryo first formed in a Brahman woman before it was transferred by Hari-Naigamesin (the divine commander of Indra's army) to the womb of Trishala, Siddhartha's wife. [note 3] The embryo-transfer legend is not believed by adherents of the Digambara tradition. Jain texts state that after Mahavira was born, the god Indra came from the heavens along with 56 dipkumaries, anointed him, and performed his abhisheka (consecration) on Mount Meru. These events, illustrated in a number of Jain temples, play a part in modern Jain temple rituals. Although the Kalpa Sūtra accounts of Mahavira's birth legends are recited by Svetambara Jains during the annual Paryushana festival, the same festival is observed by the Digambaras without the recitation. Mahavira grew up as a prince. According to the second chapter of the Śvētāmbara Acharanga Sutra, his parents were lay devotees of Parshvanatha. Jain traditions differ about whether Mahavira married. The Digambara tradition believes that his parents wanted him to marry Yashoda, but he refused to marry. [note 4] The Śvētāmbara tradition believes that he was married to Yashoda at a young age and had one daughter, Priyadarshana, also called Anojja. Jain texts portray Mahavira as tall; his height was given as seven cubits (10.5 feet) in the Aupapatika Sutra. In Jain mythology, he was the shortest of the 24 tirthankaras; earlier teachers were believed to have been taller, with Aristanemi—the 22nd tirthankara, who lived for 1,000 years—said to have been forty cubits (60 feet) in height. At age thirty, Mahavira abandoned royal life and left his home and family to live an ascetic life in the pursuit of spiritual awakening. He undertook severe fasts and bodily mortifications, meditated under the Ashoka tree, and discarded his clothes. The Acharanga Sutra has a graphic description of his hardships and self-mortification. According to the Kalpa Sūtra, Mahavira spent the first forty-two monsoons of his life in Astikagrama, Champapuri, Prstichampa, Vaishali, Vanijagrama, Nalanda, Mithila, Bhadrika, Alabhika, Panitabhumi, Shravasti, and Pawapuri. He is said to have lived in Rajagriha during the rainy season of the forty-first year of his ascetic life, which is traditionally dated to 491 BC. According to traditional accounts, Mahavira achieved Kevala Jnana (omniscience, or infinite knowledge) under a Sāla tree on the bank of the River Rijupalika near Jrimbhikagrama at age 43 after twelve years of rigorous penance. The details of the event are described in the Jain Uttar-purāņa and Harivamśa-purāņa texts. The Acharanga Sutra describes Mahavira as all-seeing. The Sutrakritanga expands it to all-knowing, and describes his other qualities. Jains believe that Mahavira had a most auspicious body (paramaudārika śarīra) and was free from eighteen imperfections when he attained omniscience. According to the Śvētāmbara, he traveled throughout India to teach his philosophy for thirty years after attaining omniscience. However, the Digambara believe that he remained in his Samavasarana and delivered sermons to his followers. Jain texts document that Mahavira's first disciples were eleven Brahmins, traditionally known as the eleven Ganadharas. Gautama was their leader, and the others were Agnibhuti, Vayubhuti, Akampita, Arya Vyakta, Sudharman, Manditaputra, Mauryaputra, Acalabhraataa, Metraya, and Prabhasa. Gautama is said to have appointed Sudharman his successor. The Ganadharas remembered and verbally transmitted Mahavira's teachings after his death; his teachings became known as Gani-Pidaga, or the Jain Agamas. According to Jain tradition, Mahavira had 14,000 muni (male ascetic devotees), 36,000 aryika (nuns), 159,000 sravakas (male lay followers), and 318,000 sravikas (female lay followers). Royal followers included King Srenika of Magadha, Kunika of Anga (popularly known as Bimbisara) and Chetaka of Videha. Mahavira initiated his mendicants with the mahavratas (Five Vows). He delivered fifty-five pravachana (recitations) and a set of lectures (Uttaraadhyayana-sutra). He preached, and died at the age of 72. The Jain Śvētāmbara tradition believes that Mahavira's death occurred in 527 BC, and the Digambara tradition holds that he died in 468 BC. In both traditions, his jiva (soul) is believed to abide in Siddhashila (the home of liberated souls). According to Jain texts, Mahavira's nirvana (death)[note 5] occurred in the town of Pawapuri in present-day Bihar. His life as a spiritual light and the night of his nirvana are commemorated by Jains as Diwali at the same time that Hindus celebrate their festival of lights. His chief disciple, Gautama, is said to have attained omniscience the night that Mahavira died. Accounts of Mahavira's death vary among Jain texts, with some describing a simple death and others recounting grandiose celebrations attended by gods and kings. According to the Jinasena's Mahapurana, heavenly beings arrived to perform his funeral rites. The Pravachanasara says that only the nails and hair of tirthankaras are left behind; the rest of the body dissolves in the air like camphor. In some texts Mahavira is described, at age 72, as delivering his final preaching over a six-day period to a large group of people. The crowd falls asleep, awakening to find that he has disappeared (leaving only his nails and hair, which his followers cremate). Mahavira's Jal Mandir stands at the place where he attained nirvana (moksha). Artworks in Jain temples and texts depict his final liberation and cremation, sometimes shown symbolically as a small pyre of sandalwood and a piece of burning camphor. Mahavira's previous births are recounted in Jain texts such as the Mahapurana and Tri-shashti-shalaka-purusha-charitra. Although a soul undergoes countless reincarnations in the transmigratory cycle of saṃsāra, the birth of a tirthankara is reckoned from the time he determines the causes of karma and pursues ratnatraya. Jain texts describe Mahavira's 26 births before his incarnation as a tirthankara. According to the texts, he was born as Marichi (the son of Bharata Chakravartin) in a previous life. Yativṛṣabha's Tiloya-paṇṇatti recounts nearly all the events of Mahavira's life in a form convenient for memorisation. 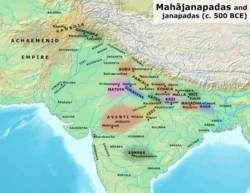 Jinasena's Mahapurana (which includes the Ādi purāṇa and Uttara-purāṇa) was completed by his disciple, Gunabhadra, in the 8th century. In the Uttara-purāṇa, Mahavira's life is described in three parvans, or sections, (74–76) and 1,818 verses. Vardhamacharitra is a Sanskrit kāvya poem, written by Asaga in 853, which narrates the life of Mahavira. The Kalpa Sūtra is a collection of biographies of tirthankaras, notably Parshvanatha and Mahavira. Samavayanga Sutra is a collection of Mahavira’s teachings, and the Acharanga Sutra recounts his asceticism. Colonial-era Indologists considered Jainism (and Mahavira's followers) a sect of Buddhism because of superficial similarities in iconography and meditative and ascetic practices. As scholarship progressed, differences between the teachings of Mahavira and the Buddha were found so divergent that the religions were acknowledged as separate. Mahavira, says Moriz Winternitz, taught a "very elaborate belief in the soul" (unlike the Buddhists, who denied such elaboration). His ascetic teachings have a higher order of magnitude than those of Buddhism or Hinduism, and his emphasis on ahimsa (non-violence) is greater than that in other Indian religions. Mahavira's teachings were compiled by Gautama Swami, his Ganadhara (chief disciple). The canonical scriptures are in twelve parts. Mahavira's teachings were gradually lost after about 300 BC, according to Jain tradition, when a severe famine in the Magadha kingdom dispersed the Jain monks. Attempts were made by later monks to gather, recite the canon, and re-establish it. These efforts identified differences in recitations of Mahavira's teachings, and an attempt was made in the 5th century AD to reconcile the differences. The reconciliation efforts failed, with Svetambara and Digambara Jain traditions holding their own incomplete, somewhat-different versions of Mahavira's teachings. In the early centuries of the common era, Jain texts containing Mahavira's teachings were written in palm-leaf manuscripts. According to the Digambaras, Āchārya Bhutabali was the last ascetic with partial knowledge of the original canon. Later, some learned achāryas restored, compiled, and wrote down the teachings of Mahavira which were the subjects of the Agamas. Āchārya Dharasena, in the 1st century CE, guided the Āchāryas Pushpadant and Bhutabali as they wrote down the teachings. The two Āchāryas wrote Ṣaṭkhaṅḍāgama, among the oldest-known Digambara texts, on palm leaves. Ahimsa (Non-violence or non-injury): Mahavira taught that every living being has sanctity and dignity which should be respected as one expects one's own sanctity and dignity to be respected. Ahimsa, Jainism's first and most important vow, applies to actions, speech, and thought. Satya (truthfulness): Applies to oneself and others. Asteya (non-stealing): Not "taking anything that has not been given"
The goal of these principles is to achieve spiritual peace, a better rebirth, or (ultimately) liberation. According to Chakravarthi, these teachings help improve a person's quality of life. However, Dundas writes that Mahavira's emphasis on non-violence and restraint has been interpreted by some Jain scholars to "not be driven by merit from giving or compassion to other creatures, nor a duty to rescue all creatures" but by "continual self discipline": a cleansing of the soul which leads to spiritual development and release. Mahavira is best remembered in the Indian traditions for his teaching that ahimsa is the supreme moral virtue. He taught that ahimsa covers all living beings, and injuring any being in any form creates bad karma (which affects one's rebirth, future well-being, and suffering. According to Mahatma Gandhi, Mahavira was the greatest authority on ahimsa. Mahavira taught that the soul exists, a premise shared with Hinduism but not Buddhism. There is no soul (or self) in Buddhism, and its teachings are based on the concept of anatta (non-self). Mahavira taught that the soul is dravya (substantial), eternal, and yet impermanent. To Mahavira, the metaphysical nature of the universe consists of dravya, jiva, and ajiva (inanimate objects). The jiva is bound to saṃsāra (transmigration) because of karma (the effects of one's actions). Karma, in Jainism, includes actions and intent; it colors the soul (lesya), affecting how, where, and as what a soul is reborn after death. According to Mahavira, there is no creator deity and existence has neither beginning nor end. Gods and demons exist in Jainism, however, whose jivas a part of the same cycle of birth and death. The goal of spiritual practice is to liberate the jiva from its karmic accumulation and enter the realm of the siddhas, souls who are liberated from rebirth. Enlightenment, to Mahavira, is the consequence of self-cultivation and self-restraint. Mahavira taught the doctrine of anekantavada (many-sided reality). Although the word does not appear in the earliest Jain literature or the Agamas, but the doctrine is illustrated in Mahavira's answers to questions posed by his followers. Truth and reality are complex, and have a number of aspects. Reality can be experienced, but it is impossible to express it fully with language alone; human attempts to communicate are nayas ("partial expression[s] of the truth"). Language itself is not truth, but a means of expressing it. From truth, according to Mahavira, language returns—not the other way around. One can experience the "truth" of a taste, but cannot fully express that taste through language. Any attempt to express the experience is syāt: valid "in some respect", but still a "perhaps, just one perspective, incomplete". Spiritual truths are also complex, with multiple aspects, and language cannot express their plurality; however, they can be experienced through effort and appropriate karma. Mahavira's anekantavada doctrine is also summarized in Buddhist texts such as the Samaññaphala Sutta (in which he is called Nigantha Nataputta),[note 6] and is a key difference between the teachings of Mahavira and those of the Buddha. The Buddha taught the Middle Way, rejecting the extremes of "it is" or "it is not"; Mahavira accepted both "it is" and "it is not", with reconciliation and the qualification of "perhaps". The Jain Agamas suggest that Mahavira's approach to answering metaphysical, philosophical questions was a "qualified yes" (syāt). A version of this doctrine is also found in the Ajivika school of ancient Indian philosophy. According to Dundas, the anekantavada doctrine has been interpreted by many Jains as "promot[ing] a universal religious tolerance ... plurality ... [and a] ... benign attitude to other [ethical, religious] positions"; however, this misreads Jain historical texts and Mahavira's teachings. Mahavira's "many pointedness, multiple perspective" teachings are a doctrine about the nature of reality and human existence, not about tolerating religious positions such as sacrificing animals (or killing them for food) or violence against nonbelievers (or any other living being) as "perhaps right". The five vows for Jain monks and nuns are strict requirements, with no "perhaps". Mahavira's Jainism co-existed with Buddhism and Hinduism beyond the renunciant Jain communities, but each religion was "highly critical of the knowledge systems and ideologies of their rivals". 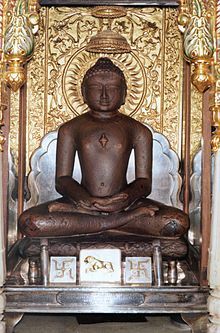 An historically-contentious view in Jainism is partially attributed to Mahavira and his ascetic life; he did not wear clothing, as a sign of renunciation (the fifth vow, aparigraha). It was disputed whether a female mendicant (sadhvi) could achieve the spiritual liberation of a male mendicant (sadhu) through asceticism. The major Jain traditions have disagreed, with Digambaras (the sky-clad, naked mendicant order) believing that a woman is unable to fully practice asceticism and cannot achieve spiritual liberation because of her gender; she can, at best, live an ethical life so she is reborn as a man. [note 7] According to this view, women are seen as a threat to a monk's chastity. Mahavirasvami had preached about men and women equality. The clothes-wearing Svetambaras have interpreted Mahavira's teaching as encouraging both sexes to pursue a mendicant, ascetic life with the possibility of moksha (kaivalya, spiritual liberation). Rebirth and realms of existence are fundamental teachings of Mahavira. According to the Acaranga Sutra, Mahavira believed that life existed in myriad forms which included animals, plants, insects, bodies of water, fire, and wind. He taught that a monk should avoid touching or disturbing any of them (including plants) and never swim, light (or extinguish) a fire, or wave their arms in the air; such actions might injure other beings living in those states of matter. Mahavira preached that the nature of existence is cyclic, and the soul is reborn after death in one of the trilok – the heavenly, hellish, or earthly realms of existence and suffering. Humans are reborn, depending on one's karma (actions) as a human, animal, element, microbe, or other form, on earth or in a heavenly (or hellish) realm. Nothing is permanent; everyone (including gods, demons and earthly beings) dies and is reborn, based on their actions in their previous life. Jinas who have reached Kevala Jnana (omniscience) are not reborn; they enter the siddhaloka, the "realm of the perfected ones". Mahavira has been erroneously called the founder of Jainism. Jains believe that there were 23 teachers before him, and Jainism was founded well before Mahavira (whom they revere as the 24th tirthankara. The first 22 tirthankaras are placed in mythical times; the 22nd tirthankara (Neminath) is believed to have been born 84,000 years before the 23rd tirthankara, Parshvanatha. Although Mahavira is sometimes placed in Parshvanatha's lineage, this is contradicted by texts stating that Mahavira renounced the world alone. Jain texts suggest that Mahavira's parents were lay devotees of Parshvanatha. The lack of detail and the mythical nature of legends about Parshvanatha, combined with medieval-era Svetambara texts portraying Parsvites as "pseudo-ascetics" with "dubious practices of magic and astrology", have led scholars to debate the evidence of Parshvanatha's historicity. According to Dundas, Jains believe that Parshvanatha's lineage influenced Mahavira. Parshvanatha, as the one who "removes obstacles and has the capacity to save", is a popular icon; his image is the focus of Jain temple devotion. Of the 24 tirthankaras, Jain iconography has celebrated Mahavira and Parshvanatha the most; sculptures discovered at the Mathura archaeological site have been dated to the 1st century BCE. According to Moriz Winternitz, Mahavira may be considered a reformer of an existing Jainist sect known as Niganthas (fetter-less) which was mentioned in early Buddhist texts. Two major annual Jain festivals associated with Mahavira are Mahavir Jayanti and Diwali. During Mahavir Jayanti, Jains celebrate Mahavira's birth as the 24th and last tirthankara of avasarpiṇī (the current time cycle). During Mahavir Jayanti, the five auspicious events of Mahavira's life are re-enacted. Diwali commemorates the anniversary of Mahavira's nirvana, and is celebrated at the same time as the Hindu festival. Diwali marks the New Year for Jains. Samantabhadra's Yuktyanusasana is a 64-verse poem which also praises Mahavira. Mahavira iconography is distinguished by a lion stamped (or carved) beneath his feet; a Shrivatsa is on his chest. Mahavira proclaimed in India that religion is a reality and not a mere social convention. It is really true that salvation can not be had by merely observing external ceremonies. Religion cannot make any difference between man and man. Mahavira is usually depicted in a sitting (or standing) meditative pose, with a lion symbol beneath him; each tīrthankara has a distinct emblem, which allows worshippers to distinguish similar idols. Mahavira's lion emblem is usually carved below his legs. Like all tirthankaras, he is depicted with a Shrivatsa[note 8] and downcast eyes. Mahavira's earliest iconography is from archaeological sites in the north Indian city of Mathura, dated from the 1st century BC to the 2nd century AD. The srivatsa mark on his chest and his dhyana-mudra posture appears in Kushana Empire-era artwork. Differences in Mahavira's depiction between the Digambara and Svetambara traditions appear in the late 5th century AD. According to John Cort, the earliest archaeological evidence of Jina iconography with inscriptions precedes its datable texts by over 250 years. Many images of Mahavira have been dated to the 12th century and earlier; an ancient sculpture was found in a cave in Sundarajapuram, Theni district, Tamil Nadu. K. Ajithadoss, a Jain scholar in Chennai, dated it to the 9th centur. ^ Heinrich Zimmer: "The cycle of time continually revolves, according to the Jainas. The present "descending" (avasarpini) period was preceded and will be followed by an "ascending" (utsarpini). Sarpini suggests the creeping movement of a "serpent" ('sarpin'); ava- means "down" and ut- means up." ^ Trishala was the sister of King Chetaka of Vaishali in ancient India. ^ This mythology has similarities with those found in the mythical texts of the Vaishnavism tradition of Hinduism. ^ On this Champat Rai Jain wrote: ""Of the two versions of Mahavira's life — the Swetambara and the Digambara— it is obvious that only one can be true: either Mahavira married, or he did not marry. If Mahavira married, why should the Digambaras deny it? There is absolutely no reason for such a denial. The Digambaras acknowledge that nineteen out of the twenty-four Tirthamkaras married and had children. If Mahavira also married it would make no difference. There is thus no reason whatsoever for the Digambaras to deny a simple incident like this. But there may be a reason for the Swetambaras making the assertion; the desire to ante-date their own origin. As a matter of fact their own books contain clear refutation of the statement that Mahavira had married. In the Samavayanga Sutra (Hyderabad edition) it is definitely stated that nineteen Tirthankaras lived as householders, that is, all the twenty-four excepting Shri Mahavira, Parashva, Nemi, Mallinath and Vaspujya." ^ Not to be confused with kevalajnana (omniscience). ^ Samaññaphala Sutta, D i.47: "Nigantha Nataputta answered with fourfold restraint. Just as if a person, when asked about a mango, were to answer with a breadfruit; or, when asked about a breadfruit, were to answer with a mango: In the same way, when asked about a fruit of the contemplative life, visible here and now, Nigantha Nataputta answered with fourfold restraint. The thought occurred to me: 'How can anyone like me think of disparaging a brahman or contemplative living in his realm?' Yet I [Buddha] neither delighted in Nigantha Nataputta's words nor did I protest against them. Neither delighting nor protesting, I was dissatisfied. Without expressing dissatisfaction, without accepting his teaching, without adopting it, I got up from my seat and left." ^ According to Melton and Baumann, the Digambaras state that "women's physical and emotional character makes it impossible for them to genuinely engage in the intense [ascetic] path necessary for spiritual purification. (...) Only by being reborn as a man can a woman engage in the ascetic path. Later Digambara secondary arguments appealed to human physiology in order to exclude women from the path: by their very biological basis, women constantly generate and destroy (and therefore harm) life forms within their sexual organs. Svetambara oppose this view by appealing to scriptures." ^ A special symbol that marks the chest of a Tirthankara. The yoga pose is very common in Buddhism, Hinduism, and Jainism. Each tradition has had a distinctive auspicious chest mark that allows devotees to identify a meditating statue to symbolic icon for their theology. There are several srivasta found in ancient and medieval Jain art works, and these are not found on Buddhist or Hindu art works. ^ a b c d e f g h i Dundas 2002, p. 24. ^ a b c d Taliaferro & Marty 2010, p. 126. ^ a b c d e f Dundas 2002, p. 25. ^ Dundas 2002, pp. 25–26. ^ a b c Heehs 2002, p. 93. ^ a b Kailash Chand Jain 1991, p. 32. ^ a b Potter 2007, pp. 35–36. ^ Dundas 2002, pp. 24–25. ^ Doniger 1999, p. 682. ^ a b c d von Glasenapp 1925, p. 29. ^ a b c d e Doniger 1999, p. 549. ^ Umakant P. Shah 1987, p. 3. ^ Rapson 1955, pp. 155–156. ^ Cort 2010, pp. 69–70, 587–588. ^ Kailash Chand Jain 1991, pp. 74–85. ^ Kailash Chand Jain 1991, pp. 84–88. ^ a b c Zimmer 1953, p. 224. ^ Jain & Upadhye 2000, p. 54. ^ Upinder Singh 2016, pp. 312–313. ^ Sunavala 1934, p. 52. ^ George M. Williams 2008, pp. 52, 71. ^ Evola 1996, p. 15. ^ Zimmer 1953, pp. 220–226. ^ von Glasenapp 1925, pp. 15–17. ^ a b c Wiley 2009, p. 6. ^ Dowling & Scarlett 2006, p. 225. ^ a b Gupta & Gupta 2006, p. 1001. ^ a b c d Dundas 2002, p. 21. ^ Dundas 2002, pp. 21, 26. ^ Mills, Claus & Diamond 2003, p. 320, note: Indra is referred to as Sakra in some Indian texts..
^ Olivelle 2006, pp. 397 footnote 4. ^ Mills, Claus & Diamond 2003, p. 320. ^ a b c Dundas 2002, p. 22. ^ Jain & Fischer 1978, pp. 5–9. ^ Dalal 2010, p. 284. ^ Umakant P. Shah 1987, p. 99, Quote: "According to the Digambara sect, Mahavira did not marry, while the Svetambaras hold a contrary belief.". ^ Shanti Lal Jain 1998, p. 51. ^ Champat Rai Jain 1939, p. 97. ^ Umakant P. Shah 1987, p. 188. ^ a b c d e f g George 2008, p. 319. ^ Jacobi 1964, p. 269. ^ a b Wiley 2009, pp. 5–7. ^ von Glasenapp 1925, p. 30. ^ Sen 1999, p. 74. ^ Dundas 2002, p. 27. ^ a b c von Glasenapp 1925, p. 327. ^ Jain & Upadhye 2000, p. 30. ^ von Glasenapp 1925, p. 30, 327. ^ Jain & Upadhye 2000, p. 31. ^ Vijay K. Jain 2016b, p. 5. ^ a b Upinder Singh 2016, p. 314. ^ a b Wiley 2009, pp. 6–8, 26. ^ George 2008, p. 326. ^ a b von Glasenapp 1925, p. 39. ^ a b c Caillat & Balbir 2008, p. 88. ^ Sharma & Sharma 2004, p. 39. ^ a b Doniger 1999, p. 549-550. ^ von Glasenapp 1925, pp. 29–31, 205–206: "At the end of almost thirty years of preaching, he died in the chancellory of King Hastipala of Pavapuri and attained Nirvana.". ^ Dundas 2002, p. 22-24. ^ a b Melton & Baumann 2010, p. 897. ^ Pramansagar 2008, p. 38–39. ^ von Glasenapp 1925, p. 328. ^ "Destinations : Pawapuri". Bihar State Tourism Development Corporation. Archived from the original on 22 July 2015. ^ Jain & Fischer 1978, pp. 14, 29–30. ^ Jain & Upadhye 2000, p. 45. ^ Jain & Upadhye 2000, p. 46. ^ Kailash Chand Jain 1991, p. 59. ^ Jain & Upadhye 2000, p. 47. ^ a b Winternitz 1993, p. 408. ^ a b Winternitz 1993, pp. 408–409. ^ Cort 2010, p. 225. ^ Vijay K. Jain 2012, p. xi. ^ a b Wiley 2009, pp. 6–8. ^ Sangave 2006, p. 67. ^ Long 2009, p. 101–102. ^ Cort 2001, pp. 26–27. ^ Appleton 2014, pp. 20–45. ^ Adams 2011, p. 22. ^ Chakravarthi 2003, p. 3–22. ^ a b Dundas 2002, pp. 88–89, 257–258. ^ Jain & Jain 2002, p. 13. ^ Titze 1998, p. 4. ^ a b c d e Taylor 2008, pp. 892–894. ^ Pandey 1998, p. 50. ^ a b Nanda 1997, p. 44. ^ "Anatta", Encyclopædia Britannica, 2013, archived from the original on 10 December 2015, Anatta in Buddhism, the doctrine that there is in humans no permanent, underlying soul. The concept of anatta, or anatman, is a departure from the Hindu belief in atman (“the self”). ^ Collins 1994, p. 64. ^ Nagel 2000, p. 33. ^ Charitrapragya 2004, pp. 75–76. ^ Dundas 2002, pp. 90–99. ^ Dundas 2002, pp. 91–92, 104–105. ^ Dundas 2002, pp. 229–231. ^ Sharma & Khanna 2013, p. 18. ^ Long 2009, pp. 36–37. ^ a b Harvey 2014, pp. 182–183. ^ Melton & Baumann 2010, p. 1396. ^ a b Arvind Sharma 1994, pp. 135–138. ^ Dundas 2002, pp. 55–59. ^ Chapelle 2011, pp. 263–270. ^ Dundas 2002, pp. 41–42, 90–93. ^ a b Long 2009, pp. 179–181. ^ Gorski 2008, pp. 125–128. ^ Wiley 2009, p. 5. ^ a b c d Dundas 2002, pp. 30–33. ^ Zimmer 1953, p. 220. ^ von Glasenapp 1925, pp. 16–17. ^ Umakant P. Shah 1987, pp. 9–11. ^ Cort 2010, pp. 25–32, 120–122, 166–171, 189–192. ^ George 2008, p. 394. ^ Bhalla 2005, p. 13. ^ Vijay K. Jain 2015, p. 164–169. ^ Vijay K. Jain 2015, p. 165. ^ Gokulchandra Jain 2015, p. 84. ^ Jaini 2000, p. 31. ^ Umakant P. Shah 1987, p. 192. ^ Zimmer 1953, p. 225. ^ von Glasenapp 1925, pp. 426–428. ^ a b Umakant P. Shah 1995, pp. 15–17. ^ Cort 2010, pp. 273–275. ^ Cort 2010, pp. 48–49. ^ Umakant P. Shah 1987, p. 193. ^ Titze 1998, p. 266. ^ Cort 1998, p. 112. Jain, Vijay K. (2016). Ācārya Samantabhadra's Ratnakarandaka-śrāvakācāra: The Jewel-casket of Householder's Conduct. Vikalp Printers. ISBN 978-81-903639-9-0. Sangave, Vilas Adinath (2001). Facets of Jainology: Selected Research Papers on Jain Society, Religion, and Culture. Mumbai: Popular Prakashan. ISBN 978-81-7154-839-2. Wikisource has the text of the 1905 New International Encyclopedia article Mahavira.